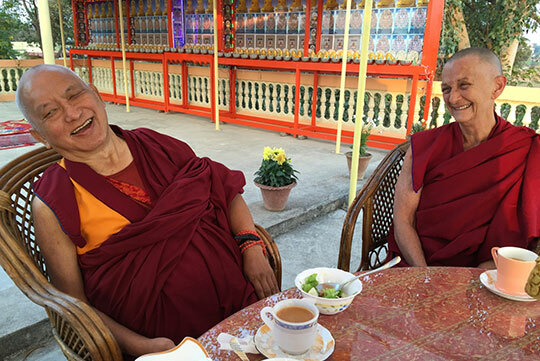 Lama Zopa Rinpoche having tea with Root Institute director Ven. Thubten Labdron, Bodhgaya, India, February 2015. Friends of FPMT – Thank You! Lama Zopa Rinpoche talks to staff and patients of Shakyamuni Buddha Health Care Centre, Root Institute, Bodhgaya, India, March 2015. 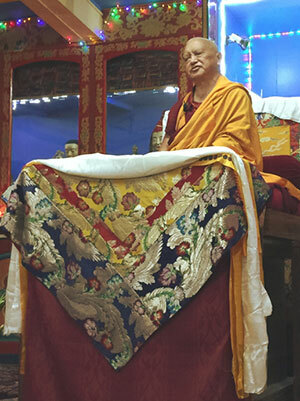 Lama Zopa Rinpoche, Italy, June 2014. 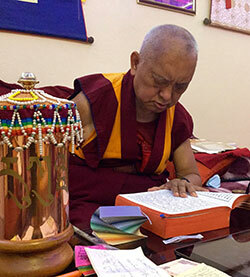 Lama Zopa Rinpoche reading Lama Tsongkhapa’s Lekshe Nyingpo, Bodhgaya, India, March 2015. Lama Zopa Rinpoche teaching on patience at Root Institute, Bodhgaya, India, February 2015. Check Rinpoche’s schedule online or subscribe to our FPMT news blog to get updates as soon as they are announced. 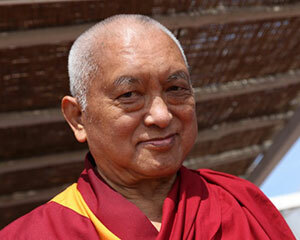 Rinpoche Available Now – Enjoy livestreams and recordings of Rinpoche’s most recent teachings! 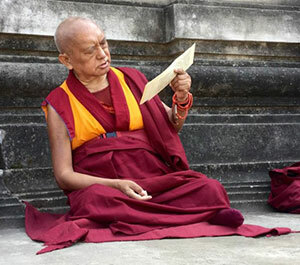 Lama Zopa Rinpoche reading Lekshe Nyingpo while circumambulating the Mahabodhi Stupa, Bodhgaya, India, February 2015. We invite you to read our FPMT Annual Review 2014: Preserving, Developing and Spreading the Mahayana Tradition and rejoice with us! The annual review is available online in eZine and PDF formats, and printed copies have recently been mailed to each FPMT center, project, service and study group. At a meeting held in South India in December 2014, His Holiness the Dalai Lama stressed the extreme importance of establishing the Geluk International Foundation and offices for the long-term preservation of the Gelug tradition. Lama Zopa Rinpoche immediately responded to this advice from His Holiness and pledged to offer US$100,000, through the Lama Zopa Rinpoche Bodhichitta Fund, toward the construction of the building needed for this project. This donation will be used for the offices of Gaden Tri Rinpoche and his staff, as well as the official office for the Geluk International Foundation. Please read more. Over the 15 days of Losar, pujas were offered by up to 16,500 monks dedicated for the entire FPMT organization and all its kind benefactors, volunteers and students! Please read more. Learn more about FPMT’s Charitable Projects and the many beneficial activities it supports. Lama Zopa Rinpoche Mantra Recitations Volume Two: In this new collection of studio recordings, Lama Zopa Rinpoche chants several prayers and mantras at different speeds, allowing students to become familiar with Rinpoche’s pronunciation and also Rinpoche’s preferred tunes. Lotus Pinnacle of Amoghapasha and Just By Seeing Mantra/Pagpa Chu Lung Rol Pai Do mantras are available on the FPMT.org mantras page. The Heart Sutra has been added as our first ebook available through the Kindle Store on amazon.com. The FPMT Masters Program Translations Project has been updated and some earlier listed translations are now available in publication. Also, General Meaning of the Middle Way by Jetsün Chokyi Gyaltsen and Ocean of Attainment (a commentary on Guhyasamaja generation stage) by Khedrub Je were added to our wish list. Ven. Angie Muir will be leading a Rituals Service Seminar at Ganden Buddhist Meditation Centre in Latvia, April 10-13. For more information and registration, please contact Agnese Bišofa. Our annual Friends of FPMT program membership drive during the auspicious weeks of Losar received an amazing outpouring of support. We welcomed well over 200 new Friends of FPMT! Our Friends program is a vital source of funding for the success of our work and mission and we rejoice in this fantastic start to the Wood Sheep year. So many thanks! Dear friends, it is time to empty your Merit Boxes and send in your offerings to support this year’s Merit Box grants! Click here to learn how to send in your offerings in time for the March 31 deadline. 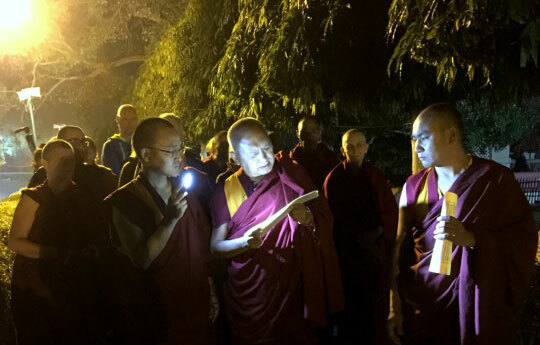 Lama Zopa Rinpoche reciting the Sutra of Golden Light for Anila Ann McNeil at 3 a.m. when she was close to dying, Root Institute, Bodhgaya, India, February 2015. A wide-ranging discussion about implementing the Five Pillars held during the North American Regional Meeting in January 2015 is now online. Read this and other supporting information. Un nouveau chapitre du Manuel de la FPMT a été traduit en français: Offrir nos services! O.Sel.Ling Centro de Retiros, Spain, offered 2,691,696 mani mantras recited between Christmas 2014 and February 15 by students around Spain. The accumulation was dedicated to the long life of His Holiness the Dalai Lama, Lama Zopa Rinpoche, and especially so that all of Rinpoche’s holy projects would be quickly fulfilled! NEW: Milarepa Center, USA has workstudy opportunities. Kadam Sharawa Centre in Australia has sadly closed: we rejoice in all its efforts to provide the Dharma over the years!